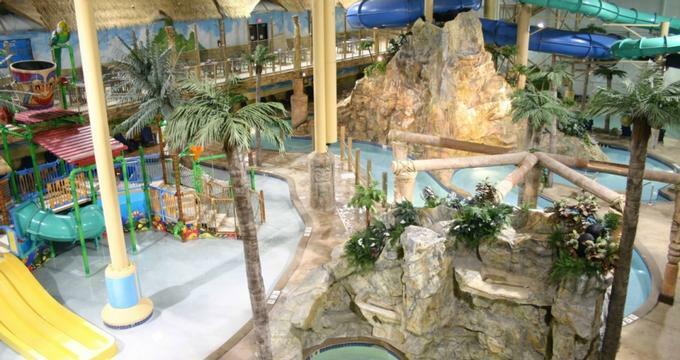 Located along the shores of Lake Superior in Duluth, the Edgewater Hotel & Waterpark is a relaxing resort that offers fun for the whole family. Situated just three miles from Canal Park, the resort features comfortable accommodations in a variety of layouts and sizes with en-suite bathrooms, modern amenities, and private balconies with lake views. The resort has an array of deluxe facilities, including a 35,000 square foot indoor water park, an outdoor swimming pool and year-round hot tub, a 40-game arcade and seasonal mini-golf, and several restaurants, cafés, and lounges. A delicious breakfast buffet is served every morning, and a free local shuttle service is available for guests to travel between the hotel and the water park. The Edgewater Hotel & Waterpark features a range of accommodations in two locations, namely the Tiki Tower and the Edgewater Classic with views over the waterpark or the lake. Guest rooms and suites have double, queen or king-size beds in deluxe linens, and en-suite bathrooms with shower/bath combinations, whirlpool tubs (some rooms), fresh towels, and designer toiletries. Some guestroom and suites have two bedrooms and two bathrooms, as well as spacious sitting areas with additional sleeper sofas for extra guests, and private balconies with beautiful views. The Tiki Kid Hut Suite is a studio designed for families with children and has a main bedroom with a king-size bed, a semi-private alcove with two sets of bunk beds, a sitting area with a sleeper sofa and television. All accommodations have modern amenities such as flat-screen televisions with cable channels, mini fridges, microwaves, coffee makers hair dryers, irons and ironing boards, and complimentary wireless Internet. The Edgewater Hotel & Waterpark has several restaurants, cafés and casual eateries, and lounges where guests can enjoy a variety of cuisine and drinks. Tiki Tom’s Big Breakfast Buffet serves a hearty breakfast to start the day, which includes egg and meat dishes, yogurt, cereals, fresh fruit, juices, pancakes, coffee, and tea. Lava Java is a casual coffee shop that offers fresh sandwiches, muffins, cookies and freshly brewed coffee and tea all day. Located in the waterpark, Tiki Tom’s Oasis & Grill serves casual cuisine during waterpark hours, including tasty appetizers, pizza, freshly made salads, healthy smoothies and mixed drinks. The Sunrise Lounge is a full service bar with beautiful views that serves an extensive list of handcrafted cocktails, signature spirits, craft beers, and fine wines from around the world. Amenities and services at the Edgewater Hotel & Waterpark include a 35,000 square foot indoor water park, a seasonal outdoor swimming pool, and year-round hot tub, and a complimentary local shuttle that runs between the hotel and the water park. The hotel has a 24-hour front desk and concierge services, a 24-hour business center with fax and photocopy services, a fully equipped fitness center with state-of-the-art equipment, and modern conference and meeting facilities. Guests have the use of complimentary bicycles and the mini golf course during the summer, a 40-game arcade is open all day, there are several restaurants, cafés, and bars, as well as a gift shop and newsstand in the hotel, and there is complimentary wireless Internet around the property. The Edgewater Hotel & Waterpark caters for special occasions such as weddings, ceremonies, receptions and business gatherings, as well as offer specialized services such as catering, entertainment and event management. The Chapel on the Lake is a stunning venue for intimate candlelit ceremonies of all denominations with breathtaking views of Lake Superior and a list of officiants to choose from. Wedding ceremony services include rental of the chapel, which can seat up to 60 guests, an officiant referral list, candelabra, a guest book stand and the setup and break down of the venue.